Understanding customers on-site, before they check out or pay the bill, has always been difficult as management has been limited to reactive decisions based on delayed and often incomplete data. IntelliVision’s Smart Retail solution instantly and continuously gathers actionable data. With this data, automatically assembled into meaningful metrics and information, management can better serve the customer and maximize store revenue and profitability. IntelliVision's Smart Retail solution is a complete suite of AI-based video analytics products for the retail environment. Brick and mortar locations make up the primary channel for many retailers, but until recently physical locations relied on archaic methods of data generation that missed key components of the in-store customer experience. Managing products, services and staff on a large scale while adjusting to consumer demands can be difficult without timely and up-to-date information. IntelliVision's Smart Retail solution provides a number of services that can deliver the needed information to streamline decisions and create more value for the customer. The Smart Retail solution takes advantage of smart cameras combined with analytical software to gather data on store operations and customer trends. Ad Metrics / Dwell Analysis – advertisement performance metrics and dwell time analysis focus on customer interactions with products and promotions. 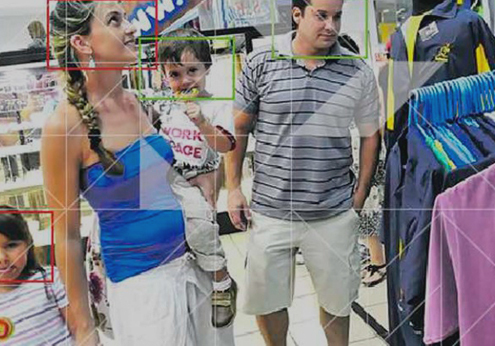 Face Recognition – with the precision of Smart Retail’s face recognition – be alerted to known shoplifters or VIPs as they enter a retail location with Smart Alerts. Customer Count – knowing how many customers enter and exit stores is valuable information and can be used to put other measures, such as gross sales, into perspective. Customer Metrics – customer metrics captures what credit and membership card swipes miss – all the customers that did not purchase anything, and more quantified, qualitative data on those that did. Intrusion Detection – monitor secure areas of your back office or warehouse with unauthorized entry or loitering detection. Queue Manager – manage your retail floor with in-depth analytics that monitor POS stations and other areas. This data can trigger alerts that notify internal teams of longer than usual wait times to allow better service of your customers and reduce unnecessary lines. Store Conversion - store conversion gives context to sales numbers. Smart Retail’s store conversion feature can accurately keep track of those who enter and purchase and those who do not. Traffic Map – see how consumers move about the premises. The system tracks where people are spending time and which products or services they come in contact with. The Smart Retail solution includes loss prevention and security tools that will not only guard assets, but alert you to potential risks. Smart Retail uses IntelliVision’s industry-leading AI-based video analytics technology to allow retailers to optimize operations by responding quickly to customer needs and market trends. Go beyond the basic traffic counts of people in and out of a retail store. 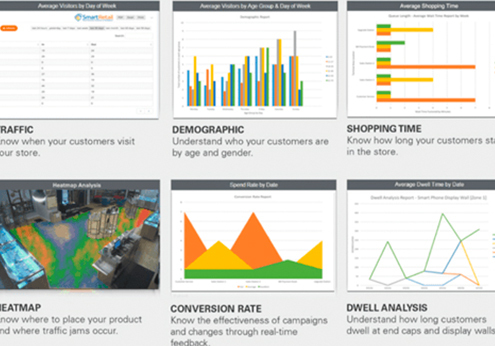 Smart Retail gives you in-depth analytics to match the data. Advertisement performance metrics and dwell time analysis focus on customer interactions with products and promotions. The number of customers passing by a designated area and the level of involvement each customer exhibits is measured, and data collected can be summarized into reports and sent to managers and/or producers of the observed product. Retailers and product manufacturers can better understand the effectiveness of promotions and advertisements along with product placement. Smart Retail uses IntelliVision’s video analytics technology to allow retailers to optimize operations by responding quickly to customer needs and market trends. Through an interactive dashboard, merchants can harness real-time in-store analytics to create a personalized, omni-channel experience, capturing shopper interest at every touchpoint. Queue Manager keeps track of how customers are lining up and being served. The system can count the number of customers in line and record wait times to aid management in distributing staff and ensuring a high quality service for the customer. 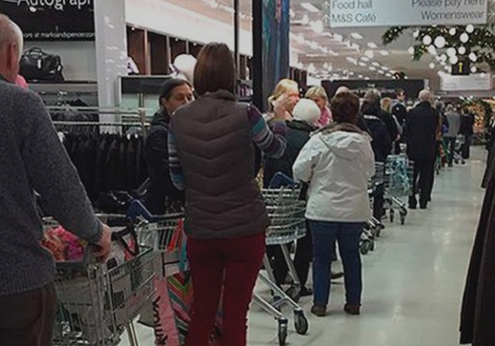 Calls for service staff at checkout counters are usually done manually, but with queue manager in place, staff can focus on serving the customer while the system keeps an eye on the general condition of queues. Why Smart Retail from IntelliVision?